Rectory Musings: Where are you God? Having reached the pinnacle of his career, in the mid 90‘s, Bono the Irish rock star and singer with U2, decided to take some time out with his wife to go and live and work in an AIDS orphanage in Ethiopia for 6 weeks. He had been deeply affected by the plight of millions in Africa, during the Band Aid appeal in the mid 80‘s, and coming here to work, was sure to be the best way to bring his rock-star self back down to earth. But in this orphanage something else and more profound happened. Later he spoke about how day after day there, he found his sense of life and his faith questioned and he would yell at God - why Lord are you not doing anything about these children! Why is no-one noticing and acting for the good for these! It’s like a a third of the children in our local primary schools were AIDS orphans, 13 million children wake each day with no parents to care for them. Where are you God? God do you care? It was over this time that Bono sensed God say to him - yes I do care - through you. From that six week stay Bono began to work, raising awareness and money for AIDS orphans and treatment and care for sufferers, mostly by sitting and waiting. He began by going to see the arch-conservative US senator Jese Helms. He was the least likely person to support the work that Bono was feeling increasingly called to, but if he could be convinced, so could others. Bono sat outside his office for weeks. No appointment. Not hassling him. What was this rock star doing here? Bono just sat and waited till the Senator was ready to hear him. When Helmes did agree to hear Bono, he sympathized with his description of "the pain [that AIDS] is bringing to infants and children and their families.” Helmes insisted that Bono brought others from the international community on board - so Bono did the same waiting game with Bill Gates, Tony Blair and others, eventually Barak Obama. It seemed like God had withdrawn from the plight of these orphans, yet through this quiet work of waiting, Bono ultimately has raised awareness of the AIDS plight and has raised in excess of $15 billion to fighting the AIDS pandemic. The Ascension of Jesus is part of the unfolding drama of the God who loves and made the world, withdrawing from it. The God of the Old Testament, frightening and other, withdrew to to welcome Jesus Christ. Jesus withdraws in anticipation of the work of the Holy Spirit in the world. Why does God withdraw? Firstly, God has nothing to prove - He is Almighty God after all. He can be here or not be here. He can intervene or not. But secondly, and perhaps more importantly, it gives God immense pleasure if people freely seek Him out for themselves and to follow Him. God is, as Mother Theresa once said, thirsty for our love. He doesn’t need it, but He delights in it. The Ascension is to a degree about Jesus. The it does clearly mark the end of his earthly ministry, but Jesus as he rises spectacularly into the heavens, is not the focus of the story. The focus of the story is the disciples. Jesus is clearly up to something as he leads his disciples out from this city as far as Betheny. He has constantly had to teach them clearly about what following Him means. What becomes clear is that they are to have a new role - they have been followers and listeners, and learners, but after Jesus is taken from them they are to be witnesses, speakers, and teachers of all that they have seen and heard, to tell others, to testify to the truth of these events. He must withdraw for that to happen. As Jesus withdraws, he is clear where the disciples’ new work is to begin - Jerusalem - the focal point of religious activity - the central place of worship for the Jews and the place to where all nations would come to meet with and be with God at the end of time. True to form right up till the end, Jesus turns this on it’s head - Jerusalem is the place from which mission must happen - it is not a finishing point where people will come to but a starting point, the centre from which they are sent out. 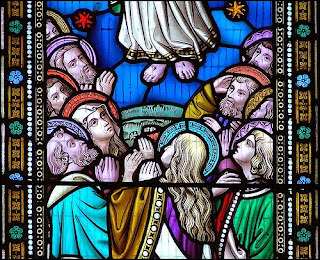 The Ascension of Jesus is mostly to do with the disciples. As Jesus withdraws, their new ministry begins and so does ours. The disciples were eventually sent out from Jerusalem, filled with the Holy Spirit and empowered to carry out the task that Jesus gave them, to witness. These disciples eventually reached Chipperfield, Sarrat, Croxley Green, Chorleywood, Rickmansworth... Faithful men and women came teaching that Jesus is the Messiah and that he had to suffer and die, that he rose from the dead, and that as a result forgiveness of sins, a new relationship with God and each other is possible. There is a saying, Christ called the disciples and the church came - implying that the church’s arrival is almost in some way second best, yet in our Gospel reading tonight we are reminded that the Church springs to life as Jesus withdraws. It marks not and ending but a beginning, as the Ascension is really about the disciples as the ministry of Jesus feeds directly into their ministry, the ministry of the Church in witnessing in a way that only an empowering of the Holy Spirit can make possible. St Augustine wrote of Jesus: “You ascended from before our eyes. We turned back grieving, only to find you in our hearts.” In other words, if we’re continuing to look for Jesus in the sky, wondering why He is no longer acting in the world, then maybe we have missed the point of His Ascension. God the Son who loves the world so much that He is willing to come and be part of it, transform it and withdraw from it never really leaves. For in this Eucharist we rediscover the Ascended Christ reigning from our hearts. Bono discovered, we discover, that God withdrawing from the world does not leave the world hopeless and helpless, but full of His presence, His life, His love through the people He loves beyond measure. The first disciples took the words and blessing of Jesus to heart and so must we. There is no sadness at his absence only worship and joy. There is no traumatic farewell. No tissues needed. No dazed looking into the sky. Jesus has left them with too much to do. No tear-filled farewell here only great joy - of the contagious variety - a joy that called disciples and has led His church till today and beyond into tomorrow, in a work of love and service that He entrusts to us. Amen.